Posted on Apr.21, 2014 by Barry Bookmark the Permalink. 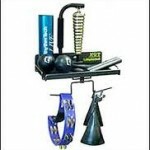 A popular medium weight boom holder with a stop lock to prevent slipping. The CH1030B is very reasonably priced and easy to transport. 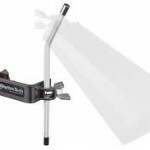 It has the Gyro-Lock cymbal tilter and features 360 degree rotation. The post is 7/8" in diameter. This is one of our favorites. It has an adapter attached to the boom arm and is ready for quick mounting. 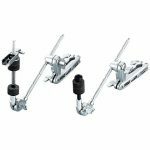 It has a gear tilter and a rotating clamp with a quick release bracket. Lightweight and easy portability! Danmar makes two versions of wood block holders. Both have adjustable settings for various size wood block inserts. These are sturdy holders and your woodblock will be well secured. One model fits on the bass drum rim and the other on a stand. We have found the Stand Mounted Version the more popular and versatile. Made in USA. The Danmar Cowbell Holder has been a standard for many years. Made of strong metal to endure high impact, the holder secures tightly to your bass drum hoop and will not slide while playing the cowbell. The bass drum version is 6" high. 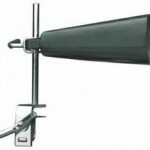 If you need your cowbell mounted off of a stand there is a version which adjusts to different size stand diameters. It will clamp securely to the stand and give more options for placement of your bell. 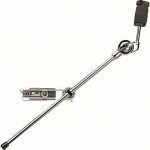 The Pearl AX-25 Adapter is the perfect quick-release clamp for connecting a boom arm or tube from one stand to another. 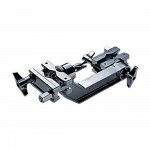 It consists of 2 revolving clamps which fit 1/2" to 1-1/8". The Ultra Grip Wing Nuts are ideal for tightening. The Pearl AX-25L, designed for a longer reach, is also available. The CH-830 Has a Uni-Lock tilter with a stop lock for slipping. This is ideal for a splash or crash cymbal. 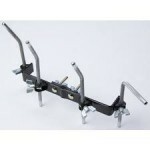 The 7/8 inch post is suitable for rack and adapter mounting. 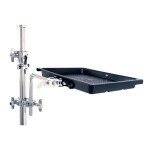 Gon Bops Small Percussion Tray with Clamp is the ideal percussion tray for your toys and gear when space is limited. Made of lightweight, molded plastic with a non-slip rubber surface, this tray is easily portable and comes with a heavy-duty clamp to attach to stands. Tray Dimensions are: 8.5"x11.5"x1.5"
This consists of 2 quick release clamps able to fit 5/8"-1 1/8". 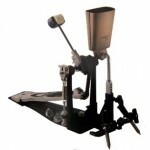 Ideal for mounting a tom or cymbal. 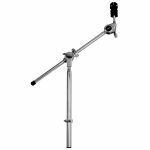 The Pearl AX-25L Adapter is the same as the Pearl AX-25 but longer. 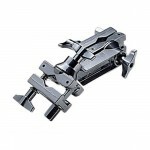 It is a 2-way adapter with quick release revolving clamps. Good when an extra long reach is necessary. The distance between the clamps is close to 6". The UX-80 is a very long adapter. It measures 13" long and has a universal rotating clamp. Designed for set-ups where flexability is necessary.